MOSCOW, January 18. /TASS/. A military exercise to eliminate "militants" was held in the mountains in the Tuva Region. It involved more than 1,000 servicemen from mountain motorized infantry units of the 41st army, the Central Military District press service reported on Friday. 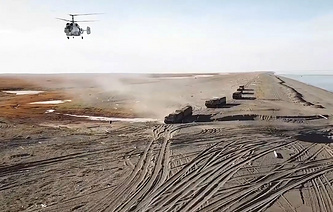 "During the exercise at the Kara-Khaak Range <...> the servicemen eliminated the ‘enemy’ in mountain conditions… More than 1,000 servicemen and about 200 pieces of military and special equipment were involved," the Central Military District reported. The press service specified that the location of a "militant" unit was detected with the help of unmanned aerial vehicles, according to the scenario, then a mortar attack was carried out against the "enemy," and motorized infantry troops set off in armored vehicles against the illegal armed groups. "The servicemen blocked them in a mountain gorge and eliminated the ‘enemy’ with all types of small arms," the Central Military District reported. The 55th mountain motorized infantry brigade has been stationed in the Tuva Region since 2014. The servicemen underwent general military training. The main base of the brigade is a military town located on the right bank of the Yenisei River. The 55th brigade became the third mountain brigade in the Russian army.